After devouring David Foster Wallace’s A Supposedly Fun Thing I’ll Never Do Again (highly recommended! ), which opens with an essay about the author’s visit to the Illinois State Fair, I never thought I could enjoy the decadence of a street fair the same way, but once again, I was wrong. Today we had the pleasure of stumbling upon not just one, but two street fairs. Down the street on Union Ave, Leo and I noticed the “street closed” signs and decided to check it out. What a phenomenal party! Later on in the evening, on our way to Lyndhurst town park, once again we hit “street closed” signs only to land on another fair. 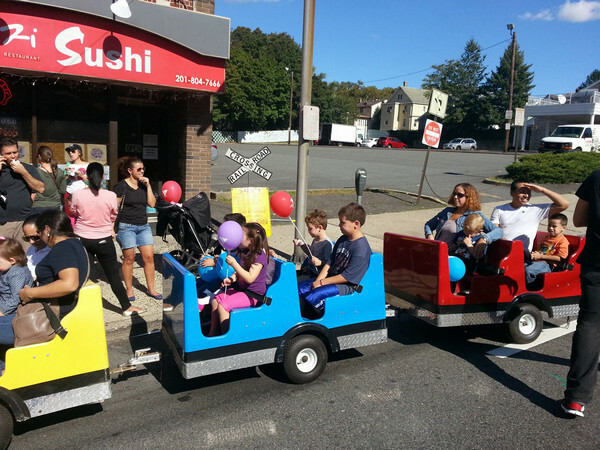 Free train ride for the kids, set up by Cliffhanger Productions. 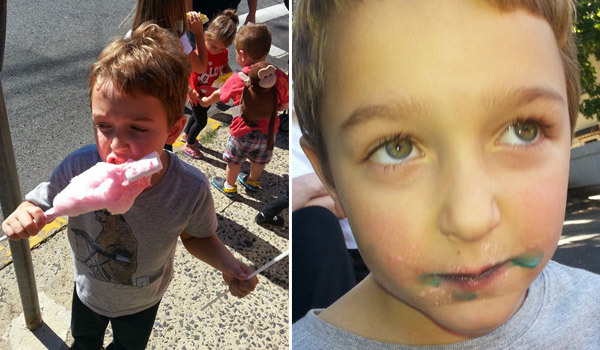 The kids’ attractions may not seem like much, but they were ALL 100% FREE! They were managed by Cliffhanger Productions, and I’m not sure if they donated the equipment and staff or if the town paid for it, but Cliffhanger did an excellent job. Their staff kept all of the kids in order, managed to keep lines always moving, and were always courteous with the kids. Leo went multiple times on all of the rides and bounce houses. As if offering free rides for the kids wasnt enough, Rutherford seemed to have struck gold with a few other vendors at the fair. Meadowlands YMCA had 3 or 4 booths, with games, balloons, and even cotton candy being offered free (Cotton candy asked for a $1 donation), and volunteers at the booths seemed to be enjoying their time as much as fairgoers. Another ultra-popular booth came from (I hope) a pet store, and consisted of several different lizard aquariums. 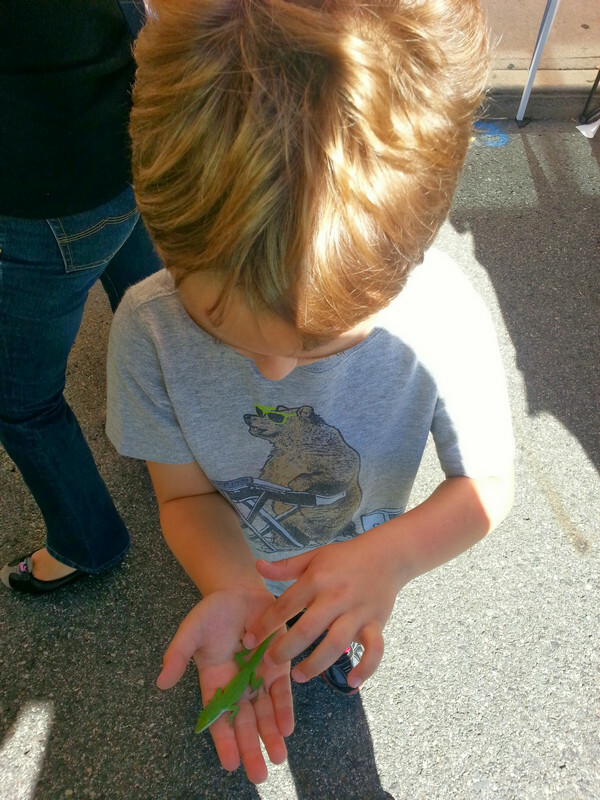 In an ingenious move, they kept a friendly lizard out of its eco-cage and allowed the kids to hold it in their hands – instant win. When we walked in around 1pm, they had about 15 aquariums on display, all gone by 4pm. 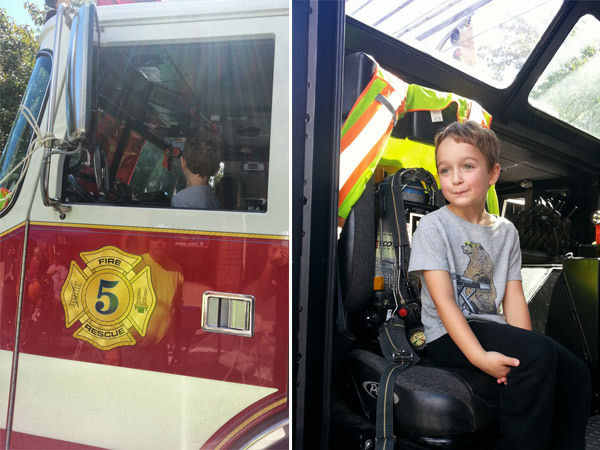 And to top it all off, the Rutherford fire department brought their rescue truck out, opened all of its compartments, and allowed the kids to explore its insides. Another huge win. Additionally, food was modestly priced and easily available (almost no lines! ), and the weather held up well. With all of that going on, this was the first time we spent more than 1-2 hours at a fair. 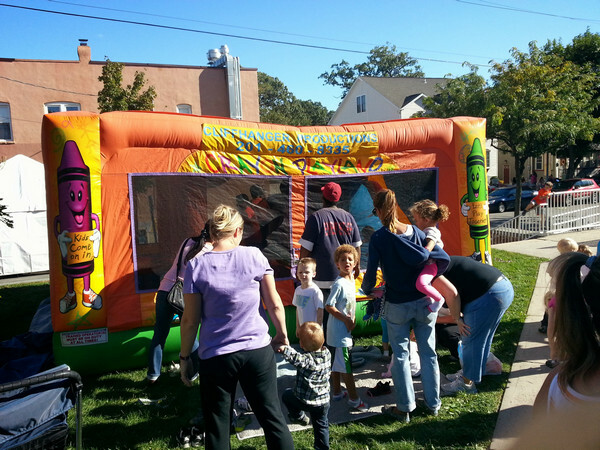 Leo’s battery didnt go out until way past 5pm, which was right around the time they were deflating the bounce houses. To offer a drastic comparison, Lyndhurst could barely hold us for 30 minutes. The fair, which was a fundraiser for Hackensack University Hospital (according to the person on the microphone, hammering the message a few times/minute), had the entire park area roped off and expected folks to pay for access. I believe it was mostly a suggestion, since they didnt seem to be kicking anybody that simply passed under/over the ropes, but an aggressive technique nonetheless. 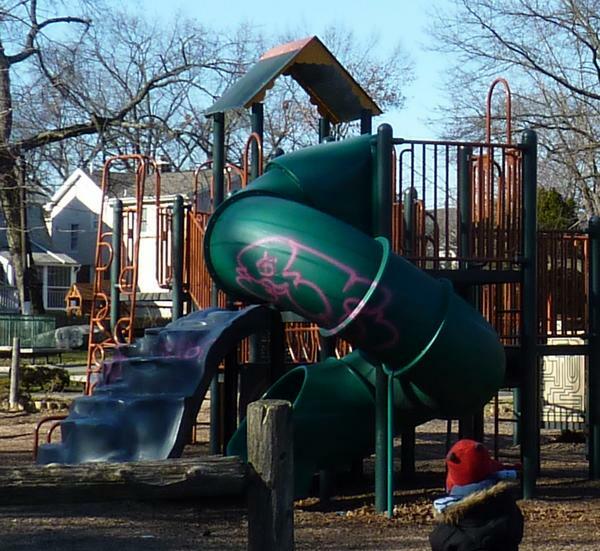 The worst part, however, was seeing the playground shut down at 7pm (when we got there). The Lyndhurst playgoung is open 7 days a week until 8pm, so I’m not sure if they simply closed an hour earlier or if they closed it entirely for the fundraiser. Roping the park is kinda bad, but shutting the park seems really unfair to the kids. Considering they also had 3 bounce houses and a not-very-safe-looking spinning carnival ride, we were willing to consider it a trade-off. However, unlike Rutherford, each bounce house required its own $3 admission ticket. Plus, there was only one kid-driven booth (face paint), and another selling generic barely-made-in-china toys, neither free (the toy booth asked $10 for a toy available on dollar tree). Other booths had an eerie feeling of garage sales, with one selling nothing but bundles of socks. Overall, it seemed the entire fair was geared towards adults, which if true, makes total sense. We did arrive there later in the day. 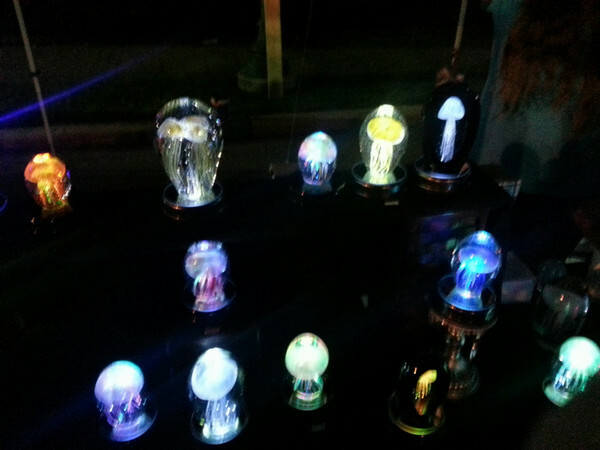 Highlight of the event – crystallized Jellyfishes, colored with glow-in-the-dark paint and encapsulated in resin displays. A really cool idea! The jellies are dipped into liquid nitrogen, then painted somehow before being engulfed by resin. I might pick one up for Leo’s room if I ever find the lady’s card (she doesnt have a website, of course). crystallized jellyfish look awesome in the evening. In 7 years living in the US, this little Rutherford street fair was the first to ever make us comfortable and in which we actually had fun. Is it fair (no pun intended) to expect other events to offer tons of free stuff for the kids? Probably not. But it does set some high comparison standards. One thing is true – promotion for both events could’ve been much better. Leo goes to school in Rutherford, and we go to Lyndhurst town park at least twice a week, and we had no idea either event was happening today.